If you're visiting the Central Pennsylvania Festival of the Arts this weekend and find your cell phone battery running low, a local solar company is ready to help. 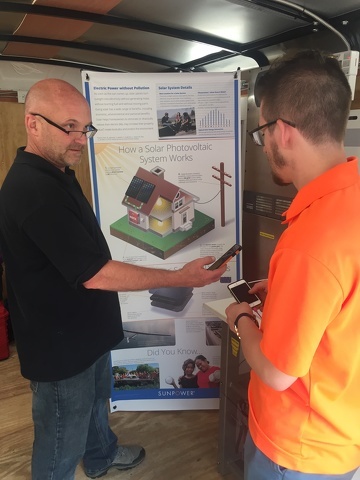 State College-based Sun Directed, which specializes in solar energy systems, has a mobile power station set up for the weekend at the Allen Street Lot (next to Cozy Thai and between South Allen Street and Sidney Friedman Park). Seven solar panels on the company's trailer power computers, monitors and mobile devices, as well as air conditioning. Even on overcast and rainy days, which Arts Fest saw on Friday morning, the solar panels still generate power. The rain had just begun to clear, the sun started to emerge, and Greg Glenn was back to work on Friday afternoon. 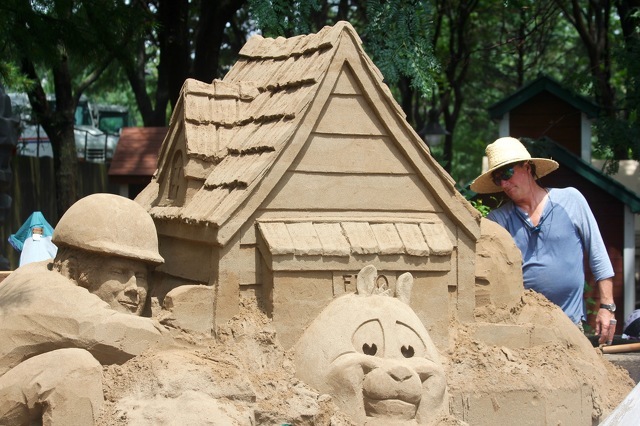 For nearly 20 years, Glenn has been creating one of the most popular attractions at the Central Pennsylvania Festival of the Arts: the annual sand sculpture in Sidney Friedman Park.